The early days of a new edition, amidst a busy army release schedule, is tumultuous time indeed. While loop-holes and unseen power combos percolate around the first waves of competitive events, many are the calls of "filth! ", "cheese! ", "power gamer! ", and yes, even worse epithets than these, if you can imagine such a thing. Welcome to Warhammer: Age of Sigmar 2nd Edition, readers, where Comp Onions grow in fertile soil. 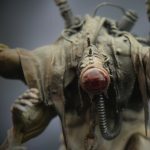 The article below did the rounds years back, but has now been lost to the ravages of cache wipes. Luckily for you, it has been preserved here in full. The original author is long forgotten, so if you know who wrote it, let me know so I can credit them. I wanted to share it because 1) I think it is very relevant these days, and 2) I want to refer to it in a future post. At the time I read this initially - 2009-ish - the New Zealand tournament scene had some very zealous tournament packs aimed at achieving someone's notion of 'balance', at the expense of some of our favourite models. I really hope this kind of thing doesn't come back. It was written in 2002, so bear in mind the context of the examples. 3) Am I a Comp Onion? Read on, you warm, friendly but ultimately deluded little scamp, and I shall answer not one, not two, but quite literally all of those questions. First off – Part 1 – What is a Comp Onion? Source – The Merriam-Webster Unabridged Enligh Dictonary. Main Entry – Comp Onion. Inflected Form (s) – Comp Onion-esque, Comp Onioned, Comped By The Onions. Etymology – Middle English, from the old English word ‘Spaz’ meaning annoying fool, and the ancient Greek word ‘Ounien’ meaning to be wrong but not have the will to see that you are. A Comp Onion is someone who completely disregards the rules of the game, in regards to what is and is not legal, and replaces them with a set of rules they quite simply ‘made up’, usually whilst in the company of friends, who tend to also be Comp Onions. Once these ‘rules’ have been made up by the Onion, he then immediately forgets that the old rules ever existed, and expects everyone else to follow his new Onion friendly rules set. People who refuse to follow the Onion, are normally called ‘Cheesy’ or some other word, which can be roughly translated to ‘Person who will not do what I tell him’. Several outdated and less funny alternatives are still in use, by the less up-to-date members of the gaming community, the main two being ‘Comp Nazi’ and ‘Comp Tzar’. 1) Its funny, without being insulting, and therefore better than Comp Nazi \ Tzar. 2) Comp Onions make you cry. 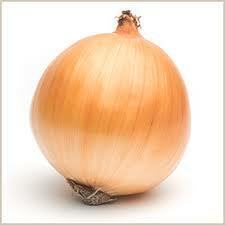 3) A Comp Onions favorite cry is ‘CHEESE!’, Cheese and Onion go together rather well. Comp Onions can live anywhere there are other wargamers gullible enough to listen to them. However, they are more common in the US, where the tournament scene is still Onion friendly. How do I recognize an Onion \ Am I an Onion? Take the test below to glean the answer to both. 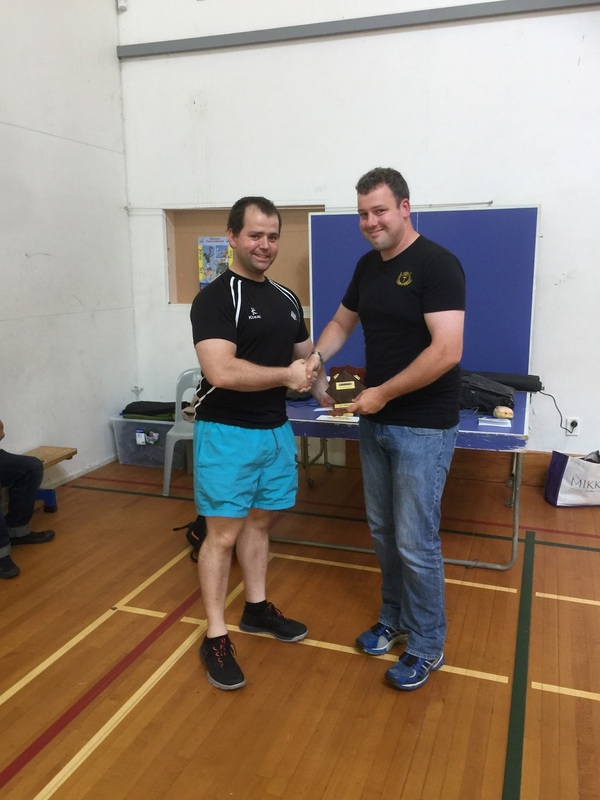 Part 2 – How Did The First Comp Onion Come About? Allow me to explain step-by-step. Step 1 – ‘The Incident’. Little Johnny is playing a game of 40k with his bestest friend in the whole wide world (Tiny Peter) and is struggling to find a way to adequately shut down Tiny Peter’s two Whirlwinds. Surely there must be something in the rules to prevent Tiny Peter from using something which might actually be effective? This is crazy! Little Johnny loses, and gets mad. Poor Little Johnny. Step 2 – ‘The Bright Idea’. That night, while getting ready for bed, Little Johnny has a fantastic idea… instead of using his brains and countering aforementioned Whirlwinds, why not just moan about it until tiny Peter is forced to stop using them?! If Tiny Peter complains, he can be called a ‘Power Gamer’, ‘Cheesy’, ‘Beardy’ or something equally original. The perfect plan, and nothing can go wrong! Step 3 – ‘A Few Days Later’. Tiny Peter doesn’t use two Whirlwinds anymore… he knows the rules say that he can, but he doesn’t want to be called a Power Gamer by Little Johnny. Problem is, he can’t use his Chaplain now either; Minute Fred has decided that it’s cheesy; nor his Assassin, as Rather Small Dave started moaning about that when it (shock! horror!) killed something in his army! Tiny Peter does want to use his two Dreadnoughts in the next game he plays, but what if they can’t be easily countered without any form of effort? Microscopic Keith would immediately label them "cheesy", and they could never be used again! What is Tiny Peter going to do? Step 4 – ‘The Flood Gates Open’. Word of Little Johnny’s breakthrough spread fast… from Shanghai to Small Heath every single unit in every single army, fielded by every single player, in every single way could not be used. ‘Cheesy!’, ‘Beardy!’, ‘Power Gamer!’. The endless chants of the Comp Onions reverberated around the world. “But what about the rules?” shouted Massive Tom. “What have the rules got to do with anything, we can just moan until you ignore the rules in favour of our randomly formed opinions!” shouted the Comp Onions in unison. 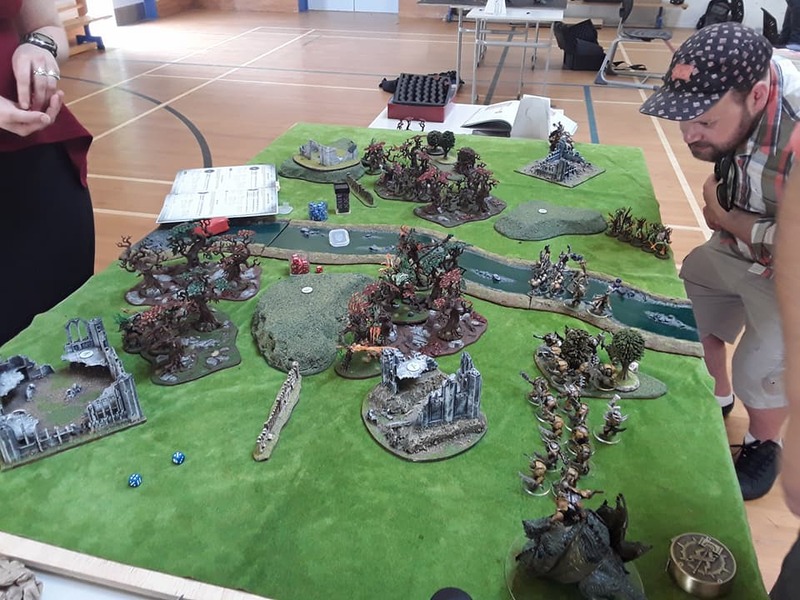 Massive Tom broke down and cried… his beloved Warhammer had been transformed by a group of ‘I know what’s best for you’ Comp Onions, and was now little more than a platform for these people to show everyone else how they should be playing. “But why can’t you just pick your list, and allow me to pick mine!” inquired massive Tom. “Allow you to pick your own list without telling you how you should be doing it!? What a ridiculous thought!” said the Comp Onions. Then the Comp Onions started to laugh; they had a fool-proof plan to stop people following the rules, and could label anyone who dared ignore them a 'second class gamer'. Massive Tom was defeated. Step 5 – ‘The Onions Are In Bloom’. It’s now several years on from Little Johnny’s superb idea. Massive Tom does still play Warhammer, but he doesn’t really enjoy it anymore. Even worse, every forum on the Internet is now infested with Comp Onions! By the time Bitsy Bob, Diminutive Derek, Itty-bitty Ian, Lilliputian Lenny, Midget Mark, Miniature Martin, Minikin Mike, Peewee Paul, Pint-size Pierre, Teensy Tim, Weensy William and Dwarfish Donald have finished with his list, he is down to the bare-bones. He would love to use that second Wraithlord he brought with his pocket money last week, but if he does, will Infinitesimal Igor ever play him again? Step 6 – ‘Oh How They Laughed’. That’s torn it! 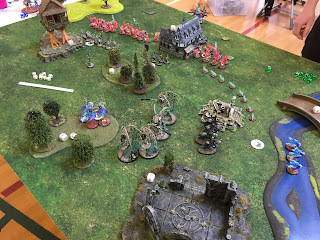 Massive Tom tried to use his lovingly painted second Wraithlord in a game against Puny Pedro… everything was going well until puny Pedro failed to kill the Wraithlord with his first shot! “Who said you could use that?” inquired the Comp Onions. “Well, erm…. I, I… I looked in the rule book”, said Massive Tom, his voice barely a quiver. The laughter from the Comp Onions was deafening. Massive Tom was driven from the store, his rule book thrown out after him, dismissed as a useless pamphlet, and the door bolted shut. 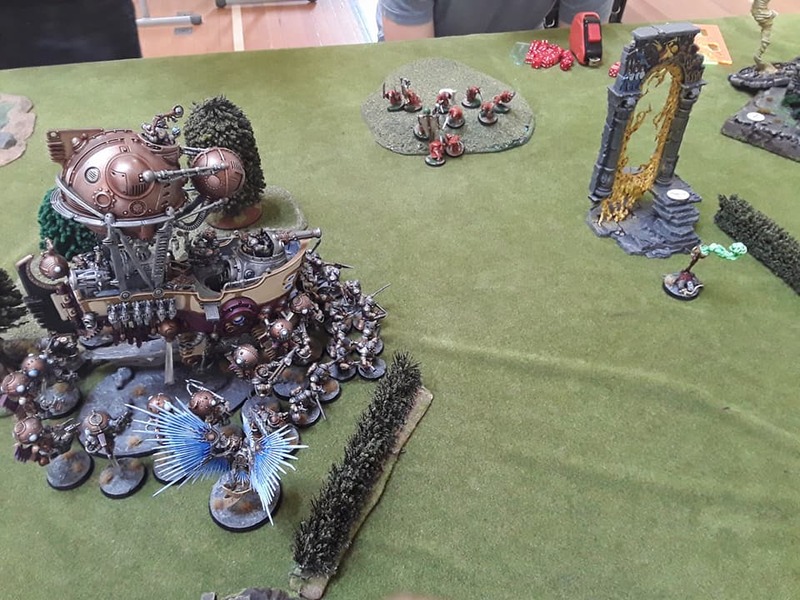 Massive Tom picked up his rule book and placed it lovingly in his bag, as he turned his back on the store for the last time, he could still hear the laughter of the Comp Onions, and they set up their Onion-friendly models for another safe game of 40k. Oh how they laughed and laughed and laughed… and if you listen very carefully, you can still hear them today, on this very forum. Part 3 – Am I a Comp Onion?! Take this simple test and we will find out. Question 1) In your opinion, what should Gamer X (your average Joe) use as the primary template for his army construction? A) The restrictions laid out in relevant Codex \ Army Book, as provided by Games Workshop. B) The random opinions of you and your friends, because ‘you know best’. Question 2) You are due to play a game of Warhammer \ 40K against Gamer X at the local Games Workshop store. He rings you the night before, you get talking, and his tells you what he will be using when you play. Included in his army is something which you have randomly decided is ‘Cheesy’. A) Re-work your list \ tactics and general outlook on the game in an attempt to think your way around the potential problems the ‘Cheesy’ unit may cause you, relishing the challenge that lies ahead. B) Moan about how Cheesy the offending unit \ model is until Gamer X agrees not to use it, and then tell your friends how cheesy it is, so no-one ever dares use it again. Question 3) You are attending the local ‘Big Boys’ tournament in a weeks time, and you find out that (Shock! Horror!) there will be an award for Best General. A) Get in a few practise games with your chosen list, make sure you will have a fighting chance, and then give it your best shot upon arriving at aforementioned tournament. B) Immediately buckle under the pressure, phone the organisers to ask if they realise the having a best General award could lead to the hideous situation of Gamers trying to win when they play; and then decide to play another safe game of ‘Onion friendly’ Warhammer at your local store. Question 4) Someone posts a 2000pt list for critique on the boards, and you are the first to view it. A) Give an honest opinion on the tactical viability, chances of doing well Vs various opponents in a friendly and Tournament environment, offer what help you can and wish the player the best of luck. B) Making sure you have a copy of ‘Never Take 2 Whirlwinds – The unofficial Warhammer 40K rules’ handy, scan the list for any units you have decided are Cheesy, and point it out. Question 5) You are working away on your computer, knocking up your latest list with Army Builder. A) Trying to get a close as possible to the force you would most like to field, staying within the rules of the game. B) Obsessed with what the Comp Onions are going to think, and basing your choices around their (predictable) responses. Avoiding things such as two Hellblasters for fear of being tagged. A) Long over-due. For a long time players who dared deviate from the opinions of the Comp Onions have had to put up with the constant attachment of the ‘Cheesy’ or ‘Beardy’ tag, so it’s about time we started ‘tagging’ back. B) Highly offensive. How dare you stereo-type me for playing Warhammer a certain way, I should be able to express my opinion and play the game the way I want without being labelled as inferior by a group of people just for having a different perspective. Question 7) If you answered ‘B’ to the last question, and have at any time in the past used the terms ‘Cheesy’, ‘Beardy’ or ‘Power Gamer’, are you being even slightly Hypocritical? B) No way, I’m right because I say I’m right. What are you, some sort of Power Gamer or something? Mostly \ All A’s – Congratulations. You are prepared to think your way out of a tricky situation, and don’t take the easy way out when presented with the chance. You realise that the rule book is infinitely more important than the randomly formed opinions of little Johnny and his friends, and you have the decency to let people play how they want to play. Mostly \ All B’s – You’re a Comp Onion, and no mistake. Repeat after me – CHEESY! BEARDY! POWER GAMER! Well, that's all folks. If you know of a Comp Onion, operating in the local area, I suggest you ignore everything he says, refuse to play against him, and treat him the same way he treats the rules of the game. 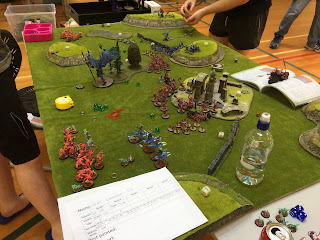 Coming to you live from Jim's car on the long road back to the Tron, we give you the final day results for New Zealand's first Warhammer: Age of Sigmar Masters Tournament! You can find the Day 1 results here. So the big news for this round was Julien beating Jimmy, effectively guaranteeing him the win, due to his kill point score. It was a very close game, which came down to the final turn. Both players came away from the table with big grins on their faces - so it sounded like a great game! Matt B effectively put an end to Aiden's winning streak. Shalom blew my army off the table. It was the perfect battleplan for her against my list, and she didn't put a step wrong, ensuring the big win. Congratulations everyone! I had a great time, and I'm sure there will be stories about some of these games going on for a while yet. If you would like to hear more about the event, keep an eye on the AOS Shorts podcast feed, as we will be doing a special episode on Masters. Best Painted (shared with Hayden H)! Coming to you live from my keyboard in a seedy motel in Paraparaumu - Tim and Jim present the 2017 Masters Tournament Day One Results! You can find the list coverage in our last post. Please note that the match-ups changed a few times as some people were unable to attend, so the pairings were re-seeded. I will cover the game play in more detail in later posts, and will just share the main highlights in results here. 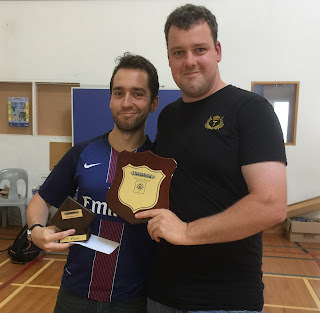 Just wanted to start with a massive THANK YOU to Nicholas J., the tournament organiser, as it has been a very well-organised event. Without exception, the players have been demonstrating top sportsmanship, and have brought their A-game. There have been no easy matches for anyone so far. At the bottom of this post are some pictures from the event, so scroll down for a look. Lastly, big thanks to the big 'gee-dubs' for the prize support! Hoping the Tron can take the big prize home for 2017! Bo beating Hayden was probably the upset of the round, as you can probably tell by the kill point totals! I had a cracking game against Matt W, who played the objectives well, despite a 'brain-melt' moment in which he let my Necromancer slip through his fingers, onto an objective (Cloak of Mist and Shadows for the win)! Aiden vs Lee also resulted in a lower-seed beating a higher seed. 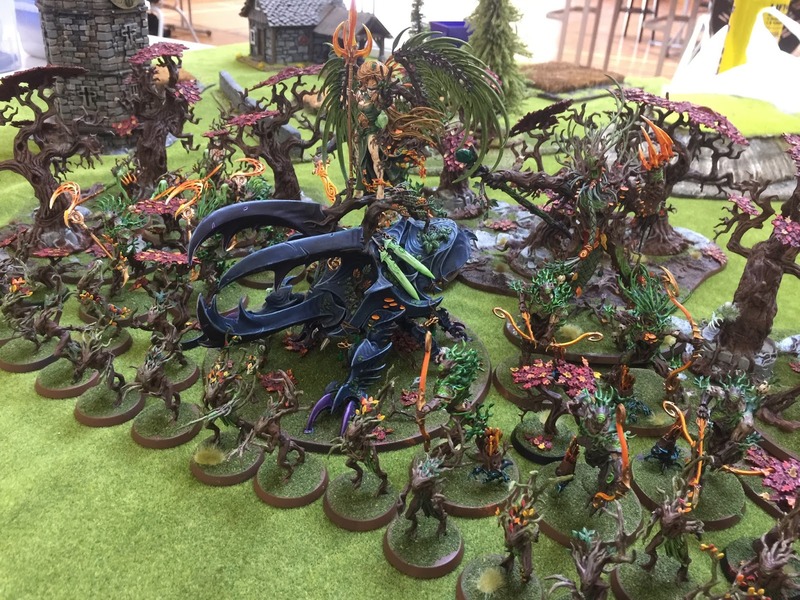 Other upsets included Lee beating Bo, winning the Sylvaneth face-off! The Dreadgrove is in competent hands and is showing results. A round of big upsets! Aiden beating Shaun was a massive deal. Shaun is by no means out of the podium race , but he is depending on the kill points scored in the top bracket. Matt W beating Matt B was also big from looking at the seeding. If you are wondering how the pairings worked for day one; there are 8 players in the 'upper' bracket, and 6 players in the 'lower' bracket after each round. The highest seeded player in each bracket plays the lowest seeded player in the same bracket. What this means is that players can lose but still fit into the top bracket, based on their kill point score. There is a small chance that players can still win from the lower bracket. On day two, we have moved to straight 'Swiss Pairings', with the closest players in points play each other, moving to the next closest if they have already been matched together. 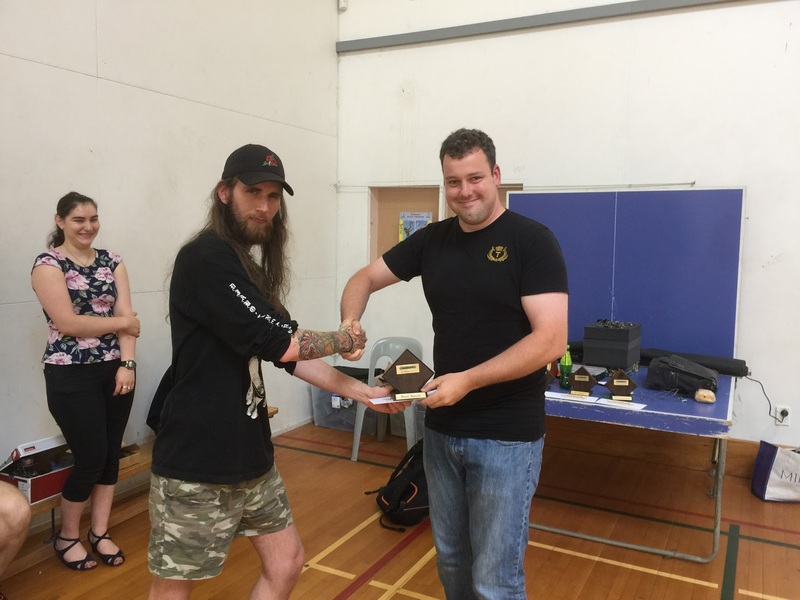 The last two years of the steadily-growing Warhammer: Age of Sigmar competitive tournament scene is finally culminating in a few weeks time, with our first Masters tournament! 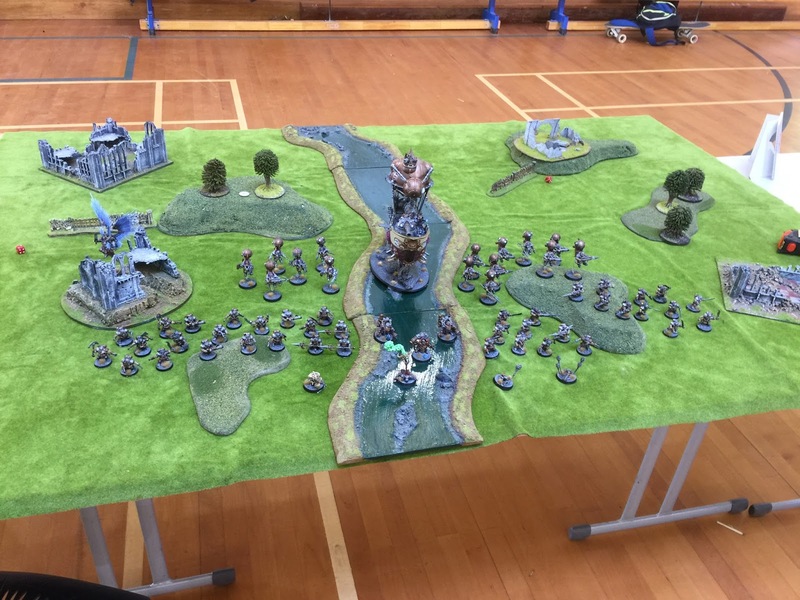 It means a great deal to myself and others who have put in a lot of our time and energy into organising events since the game launched in 2015, to cap it off with one final tournament - a celebration of the friends we have made over this time, the amazing new armies that have sprung up and of course the great games we have had! 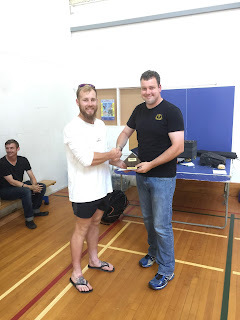 I want to acknowledge the hard work of Dan S., James P., Andrew L., James M., Nathan S., Nicholas J., and Shaun B., Rob S. and Marlin F., as well as anyone I may have missed who organised events over the last few years and contributed towards our growing scene. We wanted to try something a bit different to the other invitational end-of-year events that happen around NZ at this time of year, and so we made the event open to anyone who has played three or more events, or won a major event. Pairings for the first round are seeded based on the final rankings, with rounds two and three also being seeded but with winners playing winners. Rounds four and five will be 'Swiss Pairing'. This embodies the goal we had right at the start to try to foster an inclusive, relaxed, but by all means competitive tournament scene. It means that anyone on the rankings could potentially become the NZ Master, but the lower down you are, the harder the road will be. I am delighted by the turnout of those registered, and am looking forward to seeing everyone! This year, the NZ AOS Masters will be held in Kāpiti. The full player's pack can be viewed here (with PDF version here). The lists for each can be viewed here. Now, as I am still in the darkest depths of study mode, my associates have kindly stepped in to provide the sort of top-notch analysis you have come to expect. Much about him is a mystery. They say when he is cut, he bleeds dice. Rumour has it when he was born, the hospital produced a spreadsheet instead of a birth certificate. No-one really knows the truth. All we do know, is his name is "Jim". Jim has been assisted by the now internet-famous Antipodean Dan Himself! Go check out his podcast AOS Shorts if you are not already a listener. Thanks guys for your hard work! From what I have seen, the lists coming to Masters are absolutely top-tier, and pretty much everyone is in with a chance. Ok so Age of Sigmars first masters event for New Zealand! As a disclaimer not everything in the lists is covered by this review, so for participants make sure you review all your opponents list and know what they do! Aiden has ventured far and wide from his daemon nurgles to bring us his skaven nurgles. 90 Plague monks in the congregation of filth along with the plague furnace gives them re rolled failed charges and a 6up ward save. These bodies are use as a shield while getting his verminlord corruptor, screaming bell, plague furnace and 3 plague priests into medium range to do some real damage. The plague furnace and 3 plague priests can all cause great plagues to manifest which can be fairly devastating - only one can go off per turn but they pack some serious punch on top of the d3 mortal wounds to all units in a 4 inch bubble from the prayers. The corruptors spell with a 13 inch range is also amazing and when backed up by the long range plague catapults killing high priority targets this list is very well rounded. The other factor you have to take into account is the 90 plague monks do actually pack a punch! When combined with the prayer to give them +1 to wound these guys on top of the corruptor giving them +1 attacks this can really go off against lower armour armies. 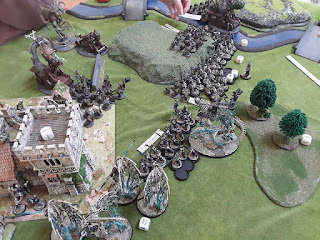 The army does have a slight weakness in its on the slower side and getting into 13 inch range without taking casualties is hard but i can really see this army going off some games with its 3 phases of damage. Hayden is running Kharadron Overlords and boy does it pack a punch for anyone not expecting what it can do. His units can start deployed in his ironclad which can be deployed in the sky awaiting to come down in the first hero phase. The ironclad can then move during the hero phase once per game and deploy his army right up on your lines augmenting his troops with extra attacks from the aether khemists. His most damaging combo lies augmenting his Endrinriggers with plus 2 attacks to give them massive melee damage at rend 2 hitting on 3s wounding on 2s doing d3 damage. These endrinriggers can also quickly redeploy with a 12 inch move and a 4up chance to move an extra 24 inches towards scenery or 10+ wound single models! The amount of pick the army has is also impressive with another aether khemist option being the 6 light hooks on the arkanaut company with a 24 inch range doing d3 damage rend 2. The list hits hard and fast but is also on the lower wound side and will lose effectiveness quickly if damage can be done to them. This is definitely not an army you can be defensive against and the multitude of rend 2 damage for both melee and ranged combat means this army can deal with almost anything. For those of you who don't know, Julien was team captain for the french 40k ETC team some time ago - this guy knows his warhammer. Julien is running a rather nasty clan skyre list which has a lot of neat tricks to it. The warp lightning cannon fires in both the hero phase and the shooting phase as long as the warlock engineer is nearby from the arkhspark voltik. All the units from the Gautfyre Skorch come up in a movement phase with the warp grinder team. The warp grinder team is placed then all other units (stormfiends and warpfire thrower) are placed within 8 inches of the grinder team with no restrictions! Can even be placed into combat if julien so wants. 6 stormfiends pop up and do 12d3 mortal wounds worth of damage no rolling required!. On top of this once per phase clan skyre can use warpstone sparks to re roll hero attacks, spells or double the damage characteristic of a weapon - thankfully the bulk of Julien's army does (and i could be wrong about this) not have damage characteristics. The stormfiends warpfire projector, warpfire thrower and warp lightning cannons all do not have damage characteristics to double. There is a few units that do however like the 3 damage from the warp grinder can be increased to 6 (julien gets to choose after the attack is successful whether to use one which also which means attacks that do d3 can be selected to be doubled after being resolved as being damage 3 which is the acolytes and the warlock engineers pistols). On top of this the arch warlock can use a spark for free once per turn without expending one of them which he has a few decent attacks himself (d3 and 3 damage characteristics). Lastly Julien can add +1 to hit and charge for one unit from the vigordust injector which gives him one more tool to use. This list will do very well against elite lists but may struggle against lists with larger wound counts. Looking forward to seeing what this list can do in Julien's hands. Dreadwood, the new Sylvaneth one-drop hotness that focuses on combat output and a (limited) bravery bomb. 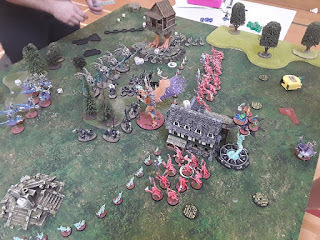 4x5 Spite Revenants, Treelord Ancient, 2 support casters, 30 dryads for bodies, 6 scythe hunters and 3 bow hunters for reach. The key to the Dreadwood is its strategems. Lee will roll a dice at the beginning of the first battleround (note after set-up and priority roll) to see how many strategems he will have, 1-3 of the following: (1) redeploy one unit up to 6” away from the enemy (expect this to be the 6 scythes! ); (2) the enemy’s attacks, abilities and spells against Deadwood units are limited to 12” for the first battleround and (3) up to 3 Deadwood units can move as if it were the movement phase (but no running) (great for camping on objectives early as needed). Dreadwood also allows the Spites to re-roll 1s to wound. The Dreadwood also contains the Outcasts battalion - In Lee’s hero phase he will roll two dice for each enemy unit within 8” of at least 2 units of Spite Revenants. The enemy unit takes a mortal wound for each point the total dice roll exceeds that unit’s bravery. This effect is boosted by the innate abilities of Spite Revenants which reduce enemy units’ bravery by 1 and requires the enemy to roll 2 dice for battleshock tests and use the highest. However, the Spite-revenants themselves are very fragile, 5 wound units with a 5+ save drop quickly. In terms of allegiance abilities, Lee is taking double Regrowth on his support casters but Verdant Blessing (if cast generate a Wyldwood) on the TLA. This is an interesting choice in that the TLA also has Moonstone of the Hidden Ways which will allow the TLA to re-deploy once in the game. Moonstone has most commonly been used on combat orientated TLAs to teleport them 4” away from an enemy unit for an easy charge. However, if Lee does this he may find that his TLA is left outside the 18” of the Regrowth from his support casters. The standard Gnarled Warrior (ignore Rend 1) load-out of the TLA will help its survivability. Will is bringing a well thought out ironjawz list. The main damage threats from this army come in the form of two units of 10 brutes and a maw krusha. These are some heavy hitting units that will lay out some serious damage to anyone who gets close. The Maw Krushas command ability to give all units +1 or +2 attacks in a huge bubble along with two warchanters for extra +hit for one or two units really brings home this damage output. The list doesn't stop there however and deploys two weird nob shamans who are amazing casters when surrounded by orruks (+2 to cast with 20 around) one of these will be used for mystic shields and the other will be casting balewind vortex to do some long range foot of gork (amazing spell) stomping which could lead to some early advantages with some half decent rolling. 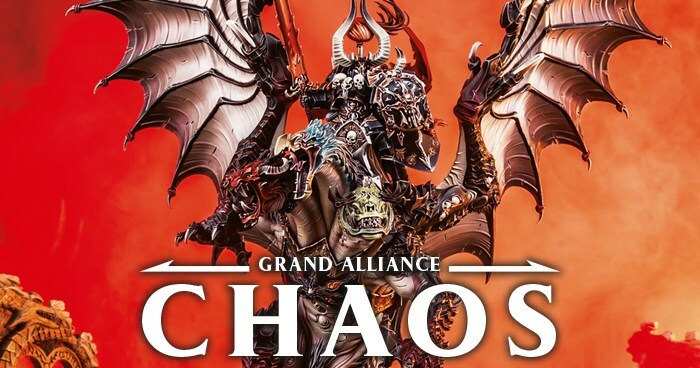 Ironjawz have some extra tricks up their sleeves on top of this with a chance to move units 6 inches in the hero phase, the ability to string together attacks when wiping out units and a blanket +1 to charge ranges. This means the gore gruntas or maw crusha could easily achieve some first turn long distance charging. Lastly the Krusha is taking brutish cunning which allows Will to pick a unit within 6 inches of him during the opponent's charge phase and attempt a charge with that unit - this can include the maw krusha itself! Leading to extra chances for excessive bulk to deal some mortal wounds. The list has two small weaknesses in the lack of ranged damage and low bravery scores which could lead to some excessive casualties from small amounts of damage but the list more than makes up for this with the tools at its disposal. Seth is running a well rounded stormcast eternals army. Seth has the lord aquillor with a 5 up ward save against mortal wounds from the shielded by faith, a chance to regen a lost wound each hero phase form the seed of rebirth and a gryph charger with aetheral stalker which gives the gryph re rolls to hit and wound vs one enemy hero for the game. The rest of seths army is a well rounded assortment of units. 6 longstrike crossbows offer ranged support while decimators, palladors and tempestors offer the bulk of the armys damage. The list also includes a heraldor for toot toot damage around scenery and a venator and relictor. This list will look to overpower its opponents by sheer force and armour saves and seth will have to make some good decisions on what to deep strike and what to not to ensure he does not lose board control. The anti rend night haunt army is a sight to behold. Nearly every model in the army ignores your rend and has you fail hopelessly at their decent armour saves. The list is lower on the damage side but will look to overcome this fact through attrition - the spirit hosts, mournguls and hexwraiths will slowly grind through your ranks. The army lacks ranged damage except the banshess abilities to do mortals vs low bravery armies. Rex has included a vampire lord for a bit of magical support allowing the casting of mystic shield where required although thanks to the midnight tome the general cairn wraith is also a wizard and maybe the vampire will be used for its -1 attacks spell to really make it a battle of attrition by lowering the opponent's damage output. 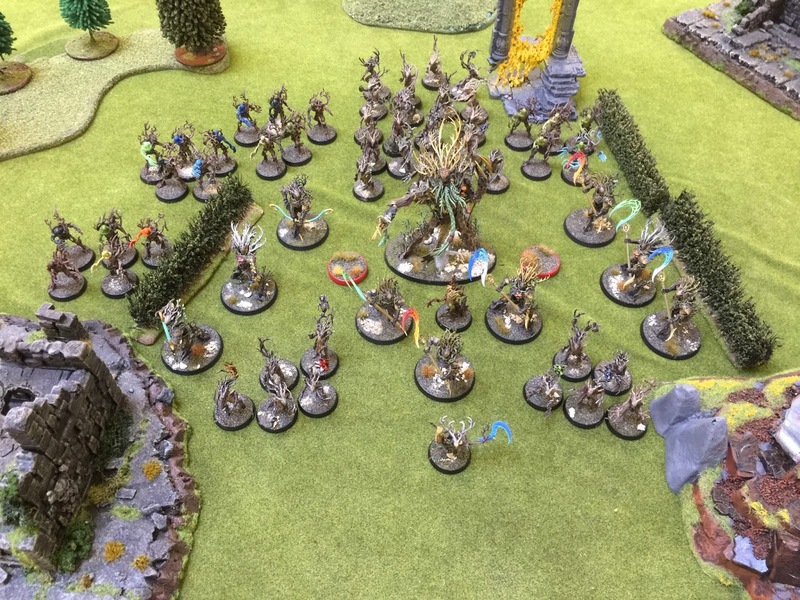 For those who have not checked out the nighthaunt allegiance abilities they can start the game in the etheral realm and deep strike on a 3+ much like a stormcast army and given Rex is taking ruler of the spirit host which allows him to re roll the dice for whether they come on i suspect this will be a key element of his strategy. The lists major weakness will be against armies with good board control and high mortal wound damage or high damage output in general (with or without rend). After a long year dominating the scene with his stonehorns matt has decided to play the shiny armoured guys. Matt is running a 6 drop Aetherstrike force with a unit of 9 longstrike raptors. 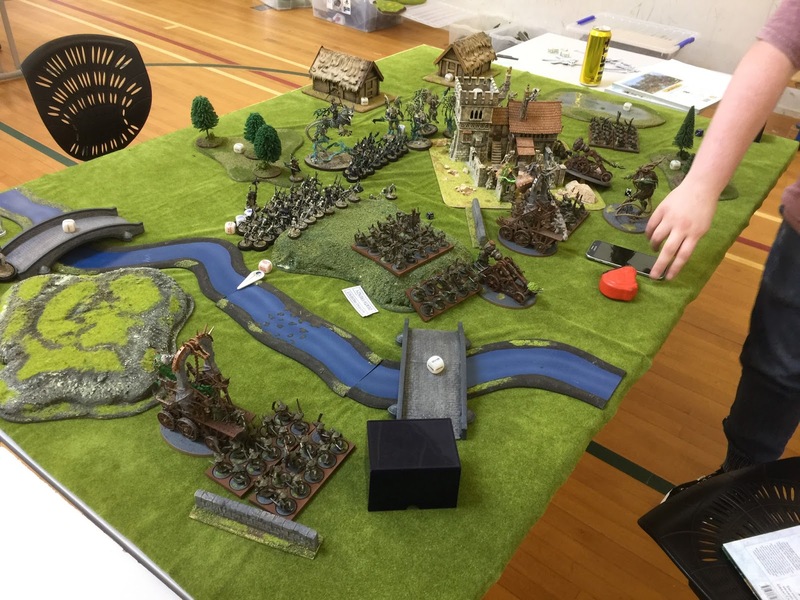 The main goal of the aetherstrike battalion is to make this near 500 point unit shoot as many times as possible. Matt gets to choose one unit in the hero phase to shoot at a unit that is within 12 inches of one of the 2 aetherwings in the force or the knight azyros (which will most likely be the longstrikes shooting). The units in the aetherstrike force include 2 aetherwings 2 vangaurd raptors 2 judicators the knight venator and the knight azyros so care must be taken when finishing off these units. When you combine this shooting with the ability to re roll 1s to hit against units near the knight azyros enough damage is done to wipe out your troops in quick succession. 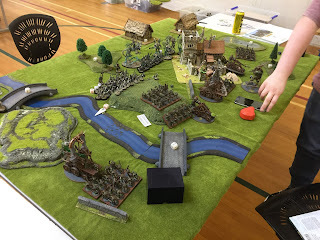 Matt has two tooters (heraldors) to blow up terrain for those who stray to close to them which leads to some much needed board control in the list. Staunch defender on his general allows a 3 up armour save bubble around him which enables the defensive blocks to live long enough to deal the damage. 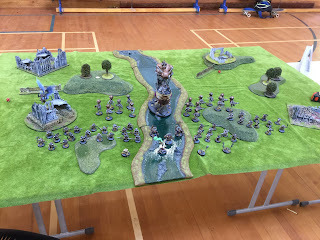 For all this shooting however the list still only has 24 inch range and there is a few lists that may cause matt a bit of trouble and the fact that its 6 drops does not enable him to set the pace of the game against a lot of the top armies at the tournament. Nicks list is a slightly slimmed down version of Wills but includes the awesome ironskullz boyz! Look for this list to do much of the same thing as wills with a straight frontal smash being the main goal of the army. The list misses out on the shooting phase the same as Wills but includes a weirdnob shaman for foot of gork and a moonclan grot shaman for curse of the bad moon. If both these spells go off for Nick this can lead to some quick removal of chaff lines, the can opener so his Maw Krusha can dig in on the softies inside. Matt is a man after my own heart running a summoning list backed up by a large unit of tzaangor enlightened. With the 840 reinforcement points matt will look to take control of the board through splitting horrors and by summoning casters up ahead in the field so they are able to do some damage first turn. This is backed up by a gaunt summoner who will most likely be using a balewind vortex to extend the range of his devastating spells. To ensure all his magics go off matt has chosen to take the blue scribes whos spell gives a bubble of rerolling failed casting attempts for his army ensuring he gets all the summons off the he wants to achieve. The army is on the heavier side at 8 drops so there is a lot of fast armies which will out deploy and threaten turn one and possibly gain board control but once matt gaines board control it's going to be very hard to move him from objectives. Matt will most likely be shielding his enlightened behind horror screens allowing them to strike back at units that assault his lines - and when enlightened get to hit second they hit hard gaining the ability to re roll both failed hits and failed wound rolls and at 2 attacks each doing 2 damage along with d3 attacks doing d3 damage all rend 1 these guys really pack the melee punch needed to back up matts magic and shooting. The shooting of course is something that shouldn't be forgotten about, there may not be any rend in it but between horrors and possible summoned flamers they can chip away with a large amount of no rend shots. Looking forward to a good showing from Matt and as a fellow tzeentch player i hope not to face him. 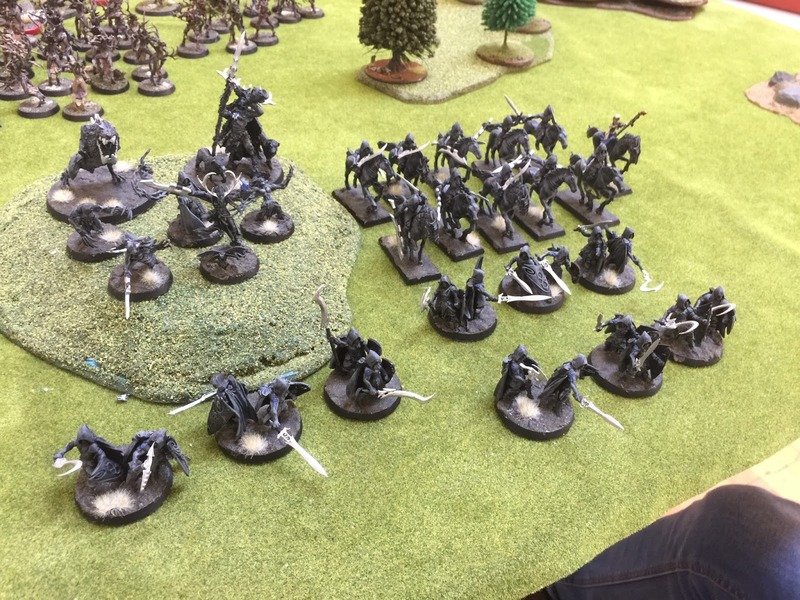 Shalom has gone for a low model count army with a trio of big characters, 20 dryads, 2x5 tree revenants and 3x3 hunters (6 bows and 3 scythes). With 9 drops, many opponents will outdeploy this list, so Shalom will be dependent on the 20 dryads to protect her main heroes. The list’s combat output rests with Durthu and Drycha. Shalom has also gone for some interesting choices for allegiance abilities. 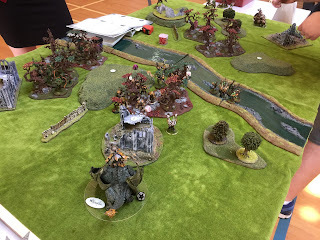 Acorn as standard for the free wyldwood turn one, Regrowth (to protect the TLA/Durthu) and Dwellers (for anti-horde) but Lord of Spites stands out. Lord of Spites allows the TLA to re-roll the first failed hit roll made in each phase, which will be useful as the TLA declines in effectiveness and the to-hit rolls get worse. 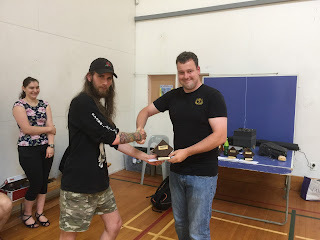 New Zealand's death incarnate, Tim has stuck with death through thick and thin and here he is at masters bringing another awesome death list. Tim is running a triple threat army with a unit of 40 skeletons, 4 morghast and 20 grave guard as the big damage threats. The morghast function well as a solo unit without any buffing and at rend 2 damage 3 offer the punch required to bring down heavily armoured defenses. The long range on the morghast also means they can sit in behind skeletons or behind black knights and strike anything that gets close without risking themselves to retaliation. The grave guard and skeletons are backed up by the wight king for +1 attacks command ability and the necromancer allowing these units to pile in twice in a single combat phase - all of a sudden no rend skeletons are bringing down even the hardiest of troops by death of a thousand papercuts. Tim is also using the legion of death allowing him an extra move in the hero phase for all units in the battalion which allows tim to have a fairly reliable turn two charge range for the bulk of his army. 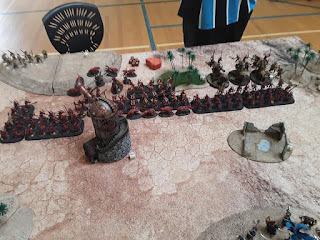 Backing up the army is none other than Arkhan the black ready to curse of years anything from the board - for those who don't know what his spell does it has a roughly 18 percent chance to inflict an infinite amount of mortal wounds on a unit and even when that does not occur the spell normally does a few mortal wounds to make it worth while casting no matter what. The list of course has some weaknesses being mainly a one phase army tim can quickly be held up in advancing by even the most minor of obstacles. Shaun is running a max unit murderhost, this allows him to not only move all the murderhost 2d6 after deployment but also during each movement phase as long as the skullmaster herald of khorne is alive and only units within 8” of him. This is combined with 2 bloodstokers to add either +6 inches to run or +6 inches to charge range for one unit - this is a nice tactic to attempt to get around lines of chaff - move up close to them, shoot holes in the chaff with skull cannons then charge 12-13 inches right around your troops encompassing you in bloodletters. To top it off shaun runs a bloodsecrator for that +1 attack bubble all those khorne players love. 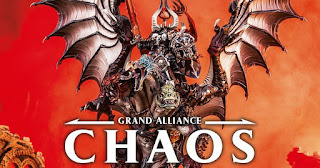 To drive this list home shaun is running it as a chaos allegiance list utilising cunning deceiver to give the opponent -1 to hit in the first battle round and favour of the gods to make his general slightly tankier with 1 extra wound. No real tricks to the army it moves forward and plows face but shaun is well versed in the intricacies of this list which has netted him a solid 3rd place in the New Zealand rankings. 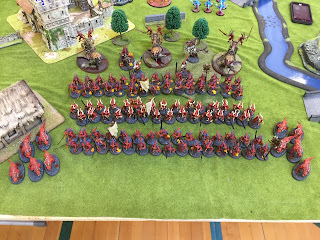 A few weak points against armies that have enough chaff to hold him back a few turns but not many lists that have that ability coming to the tourney. Bo has a reasonably balanced one-drop combat Sylvaneth list focused on Gnarlroot. Durthu supported by the Loremaster for Hand of Glory (re-roll all missed hits and wounds), 2 units of scythe hunters and a block of 30 dryads to hold the centre. If the combo comes off, Durthu could come close to unleashing all 18 damage in one combat phase. If facing this, chip wounds off Durthu early to make sure he is not hitting you at 6 damage. Thanks to the Household battalion, Bo will also be able to pin juicy targets in place for Durthu (or his scythes) using the TLA and/or one of the tree-revenant units. Bo won’t have any trouble getting woods out for the dryads to camp in with the branchwych carrying an acorn and the TLA having Verdant blessing. The TLA is also made survivable with Gnarled Warrior and Briarsheath (-1 to hit), which is super helpful against attacks causing extra attacks of mortal wounds (cough Skyfires cough). Note: This list is currently under review by the TO. Matt….. You're a bad bad man and i like it. Four thundertusks! For the uninitiated thundertusks move 8” then have an 18” shooting attack that does 6 automatic mortal wounds! Do add to the movement matt is running the beastclaw raiders allegiance which has a 33% chance to add 3inches movement in the hero phase to all his troops. All the thunderusks also carry bloodvultures to deal extra mortal wounds with a 30 inch range! Within two turns this list will quickly have dealt with the biggest threats in the opponent's army. To add insult to injury the huskard on thundertusk can also heal one unit per turn. Some interesting additions to the army includes a moonclan grot shaman for curse of the bad moon or mystic shield and a butcher who can buff or heal the ogors in the army! Ogors include all the thundertusks! Very nice addition seen it also gets to cast a spell on top of this ability, and its spell is awesome! D3 mortal wounds with a 4up chance to keep repeating d3 mortal wounds a mini foot of gork. An 80 point ally any beast claw raider player will be adding in. Apart from this there is 8 frost sabres and 4 goblin chariots whose main job will be screening units from damaging the thundertusks while they out range and heal up wounds suffered. Awesome list with not too many flaws, looking forward to seeing it do well. A Changehost, a gaunt summoner and 680 points of summoning which i have no idea what i am going to be summoning but i plan to make some purchases before the event haha. The Changehost consists of the changeling with the new rules allowing me to redeploy him after deployment anywhere in the opponent's territory not just the opponent's deployment zone. Changehost allows me to switch 2 units places swapping one model then placing the rest of the unit within 9 inches of the swapped models. This allows some extra distance forwards before casting spells with the pink horror units. The changeling can be swapped with pink horrors, lord of change or some blue or brimstone horrors to establish board control. Two drop army with high board control and summoning options. The final list overview post for NICON. This was hard work, but I hope it has proved useful. I will be doing the draw this week and emailing the participants. 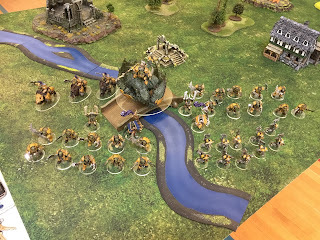 Over the weekend I will do some Facebook Live videos on the Age of Sigmar New Zealand Community, so go join if you want to see the action! Getting right into it then. I saved this Grand Alliance for last because it is arguably the most complicated. I would like to state again that I am not looking at the Allegiance abilities, but I may add some hints along the way, as some of the lists heavily lean on them for their tricks. Bloodthirster of Insensate Rage - the one with the big axe. Command ability allows any unit within 8" to re-roll charge rolls. If the axe attack rolls 6 to wound, it will dish out mortal wounds to those nearby. He can re-roll hit rolls of 1 if he charged that turn. Council of Blood - Contains the three Bloodthirsters that are not his general. In each Hero phase, one of them gets to pile in and attack. 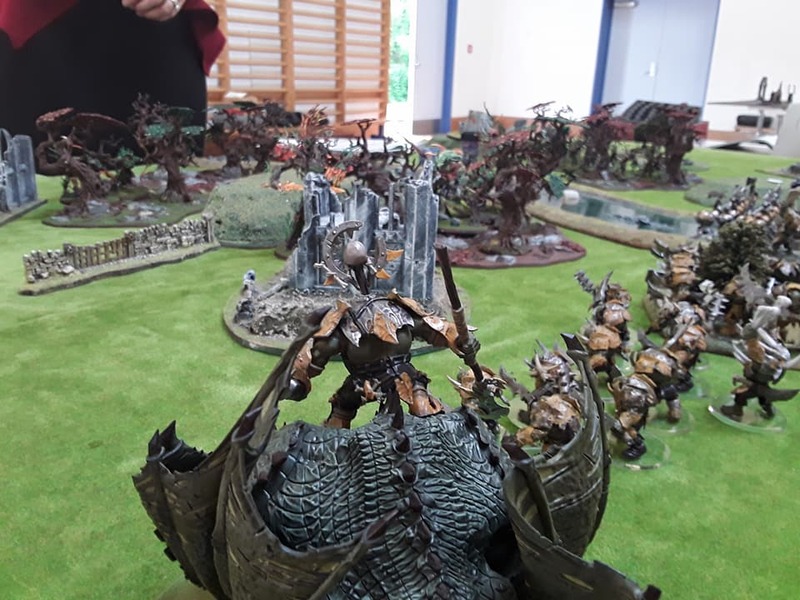 If he kills a hero or monster or wipes out a unit as part of this attack, a second Bloodthirster gets to pile in and attack. If the same thing happens, the third Bloodthirster gets to attack. This is nasty, as he can attack with these guys as normal in the combat phase. Be careful what they get into - if they can wipe them out in one turn, the damage output is going to be amazing. In addition, each Bloodthirster can use their command abilities! Taking Skarbrand and four other Bloodthirsters is quite an investment, but Adam can still field 40 Bloodletters and 10 Flesh Hounds. Whittling the rank and file down might be an option to prevent objective victories, but you're going to need to think about how to manage those big choppy guys that can get multiple rounds of combat in. 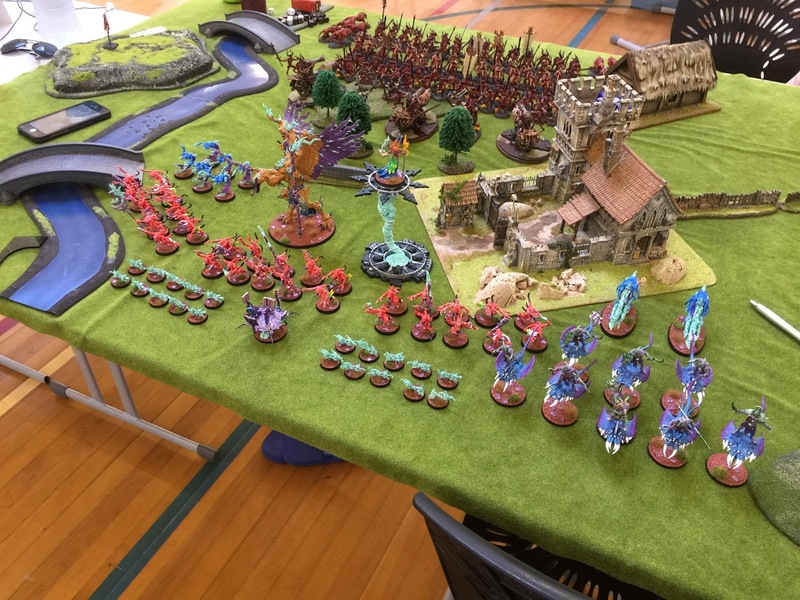 Looks like a fun army to play with! This atrmy also has the Bloodtithe mechanic, where every unit that gets wiped out will give Adam 'currency' with which to activate more and more powerful abilities and rules. The Glottkin - hard to kill and big. He heals, reduces hit rolls, deals mortal wounds when they charge, and most importantly have a spell that adds 1 to the wounds characteristic of all models in a unit. Crucially, this can be cast on any friendly unit, not just daemons. His command ability gives Nurgle units extra attacks in a 14" radius. A suspiciously Khorne-like ability, but one that will serve him well. Foulrain Congergation - Consists of a Plague Priest and three Plagueclaws. The Priest adds 1 to the wound rolls for the Plagueclaws in the shooting phase as long as they are within 13". The Plagueclaws Starting stats hit on 3+, wound on 3+, rend -2 with D6 damage. So, yeah, these are potent. What's more, if one of the Plagueclaws hits an enemy unit, the other catapults get to re-roll failed hit rolls against the same target. Congregation of Filth - Consists of a Plague Furnace and two units of 20 Plague Monks. So long as the Plague Monks have the full 20 models and are within 13" of the Plague Furnace, they can re-roll charge rolls. The Monks also get a special save on a 6+ when they suffer a wound or mortal wound near the Furnace. Skreetch has some great rules. Each turn he can pick one of the Skaven Clans, and gains a special ability depending on which one he picks. These effects include making him harder to shoot at, healing him, bonuses to wound rolls, extra weapon damage, bonuses to hit rolls, and bonuses to casting rolls. He has access to the Dreaded Thirteenth spell, which targets a unit within 13". He rolls 13 dice, and each roll of a 4 does a mortal wound. As there are no Reinforcement Points in this list, the ability to then set up a new Verminus unit nearby will not apply. Plague Monks which fight better than you would think for rats with diseases. Plaguebearer daemons, which reduce incoming hit rolls and have a special save on a 5", with re-rolled save rolls when near the Glottkin. Four units of 10 will take a bit more than usual to clear. Especially with the Glottkin spell on them. As the only player running Nurgle at NICON, I don't really know what this says about him. Or us, for enabling him. I hope he makes a speedy recovery, and wish him the best of health. Bloodthirster of Unfettered Fury - it's the one with the whip and the axe. Other abilities involve killing things in various ways. The only proven counter to a daemon of fire and shadow with a whip is to lure him onto a bridge and then crack it with your staff, plunging both it and you into the abyss. You could always attempt to fetter its fury instead, but either no-one's tried it or it doesn't work, so YMMV. 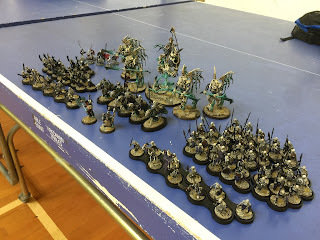 Dark Feast - A battalion with background fluff that is kind of yuck (in a Hannibal Lector kind of way), and that shouldn't have any effect on Deathrattle or Nighthaunt units in my opinion. Gore Pilgrims - All I know about pilgrims is that they like to tell each other stories on the way to their destinations (look it up, people). I assume the "Gore" part refers to their concerns over climate change, which might not be of much help in game, but you might learn a thing or two along the way. Maxing out at 8 heroes, we have Skarbrand, the Blirster, a Bloodsecrator, a Slaughterpriest, a Bloodstoker, another Slaughterpriest, Valkia the Bloody, and another Slaughterpriest. Two units of Blood Warriors, a total of 50 Bloodreavers, 2 Khorgoraths, and 5 Wrathmongers. All names that indicate to me that they are really nice guys looking to make lifelong friends. However long you would like to define 'life'. Wrath of Khorne Bloodthirster - Bloodflail guy. His command ability allows Khorne Daemons nearby to run and charge in the same turn and add 1 to charge rolls. A movement buff - keep an eye out for these, I'll come back to them. There are a couple of mid range shooting attacks to watch out for. He is extra good at attacking monsters, and has a good unbind roll. Blood Hunt - Contains the general, Bloodcrushers and Flesh Hounds. An enemy hero gets picked out, and this battalion gets a free move towards that hero. They also get +1 to wound rolls against heroes, and if the unit has not lost any models, can re-roll failed wound rolls as well. So, another movement buff. Murderhost (x3) - Each one contains one of the Bloodletter heroes and some of the Bloodletters. Allows all units near the hero to move 2D6" after set up. Another movement buff! Seeing the pattern? The Reapers of Vengeance - Contains all the other battalions and anything else in the list that doesn't fit in (Daemon Prince I think). Remember the ability in the Blood Hunt that lets it's models extra movement towards an enemy hero? Now the whole army has it.Also gives the Bloodcrushers some impact damage when they charge on a 2+ instead of the usual 4+. And they will be charging. Movement buffs and a one-drop deployment means it is likely Dan will turn-one charge you. You can either stand up to it and counter attack, or you will not. Either way, a nice quick game! 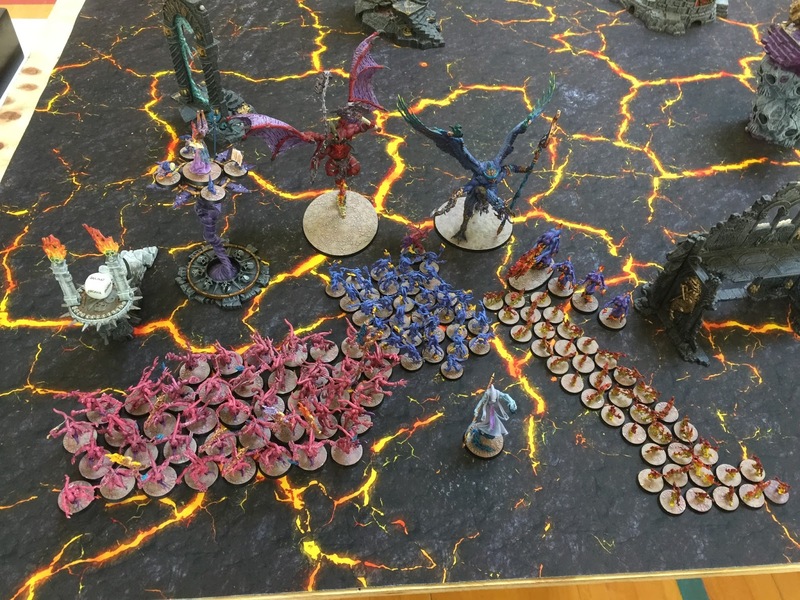 Lord of Change - Command ability allows Tzeentch daemon wizards nearby to add one to casting and unbinding. This includes the Tzaangor Shamans. Infernal Gateway is the spell, and can potentially deal heaps of mortal wounds. As a wizard he gets bonuses to magic as you'd expect, and can steal spells. Honorary Swiss Cheese list of the tournament! Finn has selected the finest hot units and thrown them together. The Bloodsecrator adds attacks to the Bloodreavers and Bloodletters, his battleline units. Sayl the Faithless will allow a unit to move real fast and fly.Shamans can reroll casting dice. the Skyfires are the elite unit that can deal massive damage at a great range, and will wreck in combat as well. You will need to deal with these. quickly. 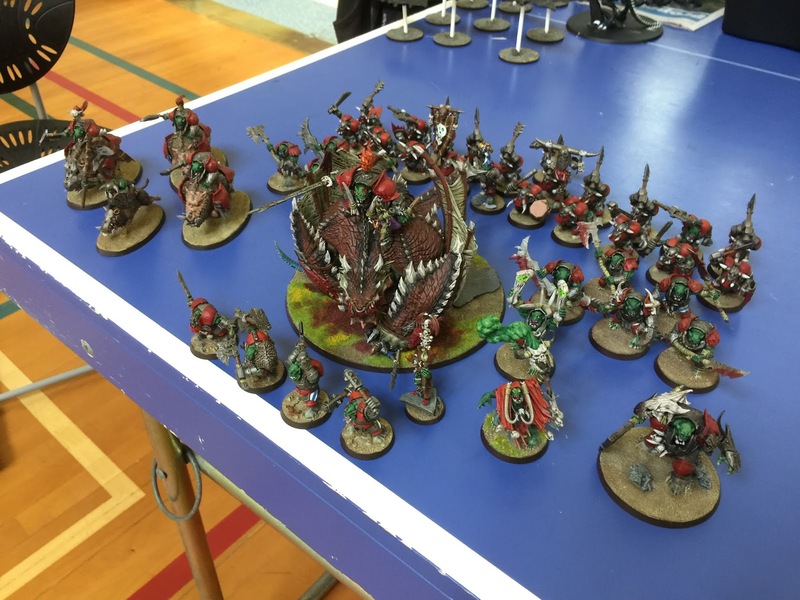 The Stormfiends again can do a lot of damage, and are commonly paired with Sayl's spell to get them within range to do some good shooting damage. His army does take up a lot of board space with the 32 and 40 mm bases, so ranged threats will work well against him, as will anything that can neutralise his magic. If you can't avoid or withstand his shooting attacks or have to go for him early, you are going to fare less well. 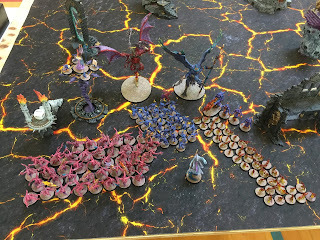 Lord of Change - As per Finn's list, but this army has the Tzeentch allegiance, and access to some great allegiance abilities and spells. Jim will have some flexibility about what he takes, and it will depend on your own army. So watch out I guess. Arcanite Cabal - Contains three Tzaangor Shamans. One of them becomes a master. It allows this model to generate a new Destiny Dice every time he spends one on a 4+. When all three are near each other, each gets to cast an extra spell. So that's two spells each. Skyshoal Coven - Contains the Enlightened and Skyfire units. These units can move 9" in the Hero phase, making absolutely sure that you can never escape them. To add insult to injury, if they fly over one of your units there is a change they can drop change-bombs on you dealing mortal wounds. Changehost - Contains the rest of the daemons in his army. This is tricksy. Each hero phase Jim can swap two of these units around. They just swap places. And then he can do it again because he has nine units. Take a moment to consider the possibilities. He can move things in and out of combat, reform sneakily to get things within spell range, take objectives, etc etc. I've seen it in action. Large screening units of Horrors, which can shoot and cast magic, and swap places with each other. Skyfires will waste you from afar and Enlightened will waste you up close. They will reach you because they are fast. Possible the greatest trick is Jim's ability to regenerate Destiny Dice. I've seen him spend 30 destiny dice within the first two turns. Once he gets to zero he's in trouble, but that's enough to make some very safe risks and manipulate the game to suit his plans. It's likely you're going to have to just take it as it comes, but if you can stop his magic, take out the heroes, take out the Tzaangor in one round, you might get him on the back foot. Bull Centaur Taur'uk - Command ability allows bull centaur units nearby to run and charge in the same turn. Does extra damage when he charges. I hope this army makes you as happy as it makes me. I'm not sure our nation has ever seen a Bull Centaur-based army in a tournament! Two Taur'uks, Shar'tor the Executioner himself, This guy is a bug version of his race. He can buff charge rolls. There is a Daemonsmith for a bit of magic, a spell that can reduce enemy shooting and movement. No less than nine Bull centaur renders whose role is fairly straightforward. Battleline is in the form of Chaos Marauders, who are essentially slaves to the will of their dark, bovine masters. The evil Duardin supplement the bulls with a Skullcracker war engine and two Hellcannons. These last ones will hurt. Take them out as quick as you can. So, one at a time. Skarbrand, for the angry, he will kill stuff. Lord of Change, he will magic. The Changeling, he will be set up in your deployment zone potentially and can slow down your army. This will be really useful against some of those alpha strike armies. You can reveal the Changeling by moving a hero within 3". Deathmaster Snikch, back from the Old World with a new kill contract.He will be hiding in one of the Gutter Runner units, and has a few bonuses when attacking heroes. Sayl the Faithless, to help deliver Skarbrand to his targets most likely. Daemon Prince of Nurgle, not to be underestimated - solid fighter with a good save. 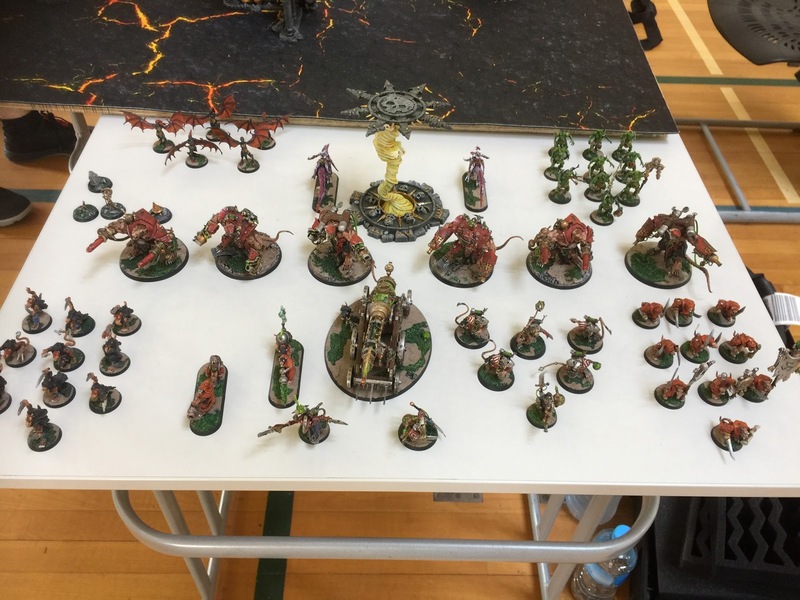 Rank and file include Bloodletters, Pink Horrors (who can cast), Marauders (great value chaff), Stormfiends (dakkapew), Skyfires (ranged threat that will hurt a bunch) and Gutter Runners. The assassin rats are going to be objective threats, able to come on the board where you least expect them. 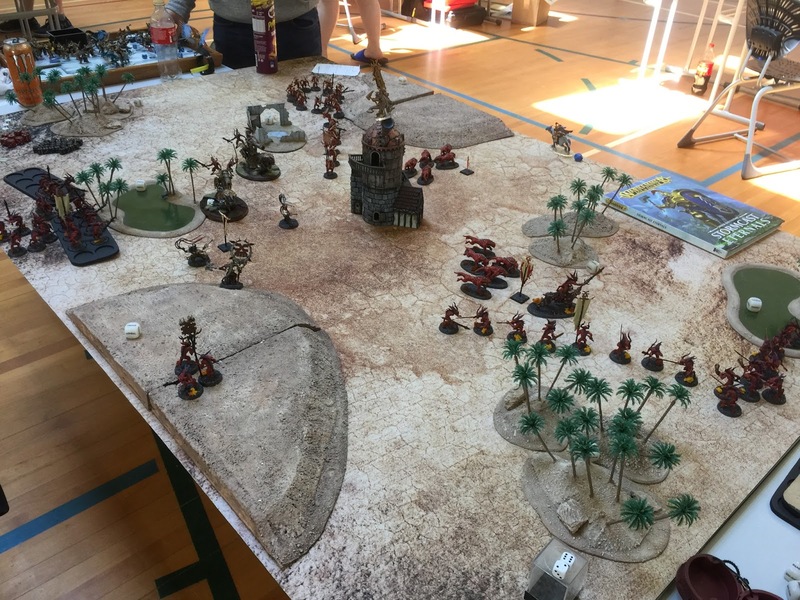 I lost a tournament due to these guys, grabbing an objective on the last turn. 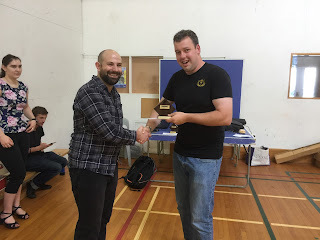 Julien is a renonwed 40k player who won his first tournament at Equinox, so he has a wiley plan! Verminlord Deceiver - the big assassin rat daemon. Allows Eshin models (just himself) to re-roll failed wound rolls. The Skitterleap wont be of use, as there are no Skaven heroes to swap places with. Does some good bonus damage against units with more than 10 models. Some big names in this army! Sayl, making his third appearance in a NICON list. Kairos Fateweaver, who can change a single dice roll to whatever he wants, is good at casting. The Glottkin, who has been mentioned in Aiden's list. 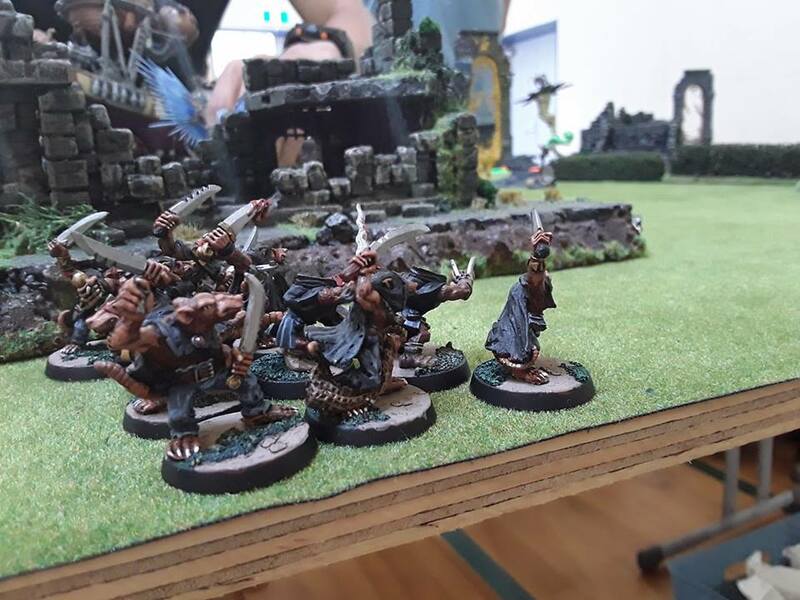 Clanrats and Plaguebearers make up the battleline, with a big unit of Stormfiends a big investment, for Sayl to teleport within range of targets. A big unit of Warhounds to get across the board or flank if needed, and a Warp Lightning cannon, which can help target hey models. An interesting army that will rely on all the pieces working in tandem, as mixed arms armies do. Lord of Change - he's been covered a few times, but bear in mind that as Sam has the Tzeentch allegiance, this gives him access to the Destiny Dice and extra spells and allegiance abilities. This means Sam can be adaptible depending on his opponent. Multitudinous Host - Contains a Herald of Tzeentch and Horrors of a variety of shapes and sizes. In each of his hero phases, he can add D6 Pink/Blue Horrorss and D3 Brimstone Horrors back to each unit! This will work in the same way as the Skeleton unit standards. He won't be able to increase them passed the starting size, but it will make sure the units are much more durable, forcing his opponent to focus fire. Not always possible with the other nasties in his list! Really good variety in this list. Kairos, because awesome. A Gaunt Summoner, who has a spell that deals mortal wounds to each model in a unit on a 4+. Spells like this in previous editions of Warhammer were very powerful, and this will be very effective in some of the horde armies. A Tzaangor Shaman adds even more magic dominance, made even more potent by the inclusion of a Balewind Vortex doubling the range of one of their spells. There are almost 100 Horrors in the list, who will form very effective and durable screens. 6 Skyfires will provide some good shooting support and for taking down key targets. 20 Tzaangors, eight of them with paired weapons. Battleshock will be an issue for them. However, the do get bonuses to wound, and hit, and extra attacks, and extra saves in different situations, so they can pump out some damage too. 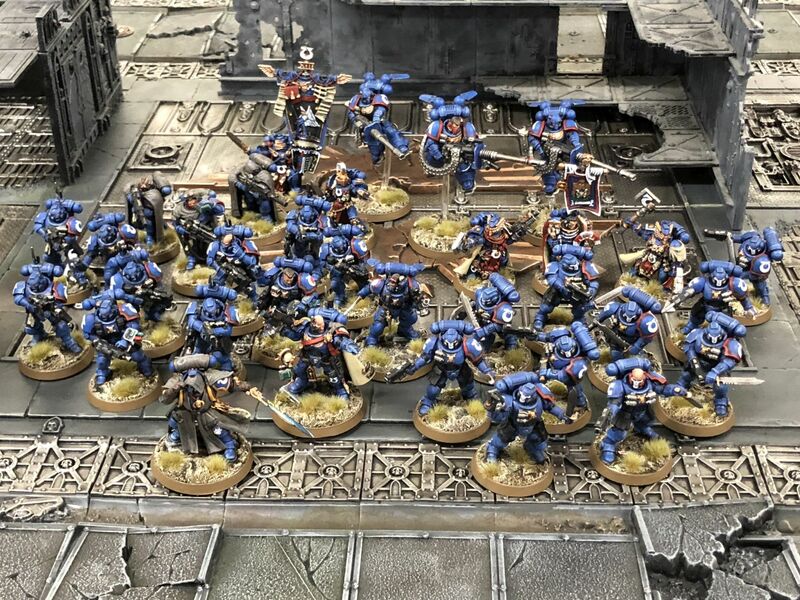 Going to be a great army to see on the table! Bloodsecrator - Just how this guy managed to steal the top job from Archaon, Destroyer of Worlds, Grand Marshal of the Apocalypse, is a mystery. We can only assume that Shaun has a dark purpose hidden within the new allegiance abilities his army has access too. This is a good time to look at this model though. He can add attacks to all nearby Khorne units. Which is all of them pretty much. That's nasty, because Khorne units already have lots of attacks that do lots of damage. Archaon himself gets an extra attack to all of his weapons! Murderhost - Contains a Herald of Khorne, the Bloodcrushers, Bloodletters, and Flesh Hounds. Allows these units to move 2D6 before the battle and in each Hero Phase. Because there was no way Khorne was going to let you escape. So, Archaon! He is quite expensive, and has some great abilities. Magic doesn't work too well against him, and if he rolls well he can do some damage. He has a good armour save too. Either pin him down or avoid him. His biggest weakness is his large base size. By placing your units sensibly you can stop him landing in key areas. For the rest of it, well it's Khorne. He will come at you, so you can try to shoot him and slow him down, or survive enough to counter attack. try to take out the Priest, the Stoker and the Secrator, as their buffs will make already formidable units very efficient indeed. That's all the lists done! Here is the draw. I will be doing some updates for the event over on the AOS NZ Facebook group so feel free to join us.